As an industry, when you’ve got Tom Craddick, consumer groups, the Midland County District Attorney and Bible-quoting Baptists arrayed against you, most likely you’re facing a serious come-to-Jesus moment. Today, a House committee heard hours of impassioned testimony in favor of legislation that would curb Texas’ Wild West payday and auto-title lending business. As Melissa del Bosque has documented, payday lenders in Texas are virtually unregulated and frequently lock consumers into a cycle of debt. Craddick’s bill, along with three other identical bills, would close a loopholethat allows payday lenders to register as consumer credit organizations (CSOs) and escape regulation. It was rather incredible to watch former Speaker Tom Craddick, who doesn’t exactly have a reputation as an advocate for the working poor, take the payday lenders to the woodshed. “No longer do I think the Legislature can stand back and watch these businesses take advantage of people in need,” Craddick said today. The impact of rates that can amount to 500 percent APR is “overwhelming – actually it’s awful,” he said. 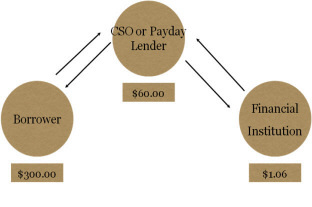 Under the proposed legislation, payday and auto-title lenders could no longer operate as consumer credit organizations, but instead would be subject to the same laws and regulations as other lenders. A cap of 135 percent – still far above the 36 percent limit imposed by many states – would be imposed on the short-term loans offered by payday lenders. Craddick’s bill is HB410, and it has a bipartisan plethora of co-authors. Other bills on the subject are HB 656 (Farias), HB 661 (Rodriguez), HB 1323 (Johnson), HB 2594 (Truitt), and HB 2592 (Truitt). Among the consumer advocates and faith leaders, consensus seemed to be that the best approach would be imposing rate caps, closing the CSO loophole and imposing existing law on the lenders. That’s Craddick’s approach. However, the payday lender industry is basically telling legislators that they will go out of business if that happens and desperate consumers will have nowhere to go for easy credit. The Craddick approach would “dramatically change the business model as we know it in a detrimental way,” said Rob Norcross, a lobbyist for the Consumer Service Alliance of Texas, an industry group. Cry me a river, dude. If your business isn’t sustainable at that APR level, you don’t have a viable business model and deserve to be made extinct. If that’s what happens, it’s a feature, not a bug. Basically, payday lenders need to be treated like any other loan-making financial institution. As the group Texas Faith for Fair Lending notes, the problem is that’s not how they operate now. payday and auto title lenders do not operate as lenders governed by the Texas Finance code as one might expect. Instead, they have found a loophole in a law called the Credit Services Organizations (CSO) Act that sets no limits on rates and fees they charge borrowers. The CSO statute was enacted in 1997 and is designed to govern how credit repair services can help those repair bad credit. In this statute CSOs are given is the authority to “obtain an extension of consumer credit for a consumer.” The intent is clearly to enable CSOs to help Texans with bad credit build up a positive lending history in order to increase credit scores. Instead, over 98% of registered CSOs in this state are payday and auto title lenders that do anything but help people repair credit. The true lender, the financial institution, charges a small interest rate and makes a little money from the short loan. The CSO charges a high fee to arrange, collect and guarantee the loan. This is typically around $20 per $100 borrowed but there is no legal limit on these fees. The borrower never interacts with the actual lender. They add nothing of value to the equation but reap huge profits by virtue of the loophole they squeeze through. That loophole needs to be closed. You can see videos of the TFFL press conference here, and more about TFFL, which is a Texas Impact project, here. If you’re a churchgoer, the odds are good that your denomination is involved in this effort. Please check it out and make your voice heard as well.